A tornado might have carried Dorothy on a great adventure to the land of Oz, but in real life, you don’t want to get anywhere near one. Tornadoes happen when warm air from the Gulf of Mexico mixes with cold air from Canada, creating unstable conditions. Warm air mixing with cold air can cause vertical columns of rotating air, accompanied by thunderstorms. Tornadoes are fascinating, but incredibly dangerous. They can move more than 300 miles per hour and destroy everything in their path. Tornadoes are fascinating, but incredibly dangerous. They can move more than 300 miles per hour and destroy everything in their path. They can blow cars hundreds of yards and move straw with such force that it sticks on tree trunks. A funnel cloud is a cone-shaped cloud that doesn’t reach the ground. 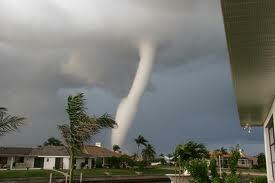 A tornado happens when the funnel cloud touches to the ground. Most tornadoes last only a few minutes. The most severe ones can last more than one hour. Tornadoes happen most often in the Great Plains states, which include Kansas, North Dakota, South Dakota, Louisiana, Oklahoma, Nebraska, Iowa and Arkansas. Tornadoes usually happen in the spring and summer. Sometimes they bring hail with them. There are over 1,000 tornadoes in the U.S. every year. A news clip of a tornado hitting Texas in 2013. Question 1: How do I know if a Tornado is coming? Answer 1: Turn on a radio or watch your television in a thunderstorm. If you hear the words “tornado watch,” you know a Tornado could happen. If you hear the words “tornado warning,” a tornado has been spotted. Take cover right away. Question 2: Where should I go in a Tornado? Answer 2: Indoors, head to a basement or a room on the first floor without windows. A closet or bathroom is a good place. Hide under a table if you can. Outdoors, get down in a ditch or other low area. Don’t try to outrun a tornado. Question 3: Is a Tornado the same as a Twister? Answer 3: Yes a Tornado and a Twister are the same thing, just different wording. Although some people refer to the term twister as a small tornado. Meteorologists tend only to use Tornado. Question 4: What country experiences the most Tornadoes? Answer 4: Unfortunately the United States suffers most Tornadoes. Nowhere in the US can be sure to avoid a tornado but states like Texas, Oklahoma and Florida bare the brunt of them. Question 5: How is a Tornado measured? Answer 5: A Tornado is measured based on the wind intensity. The F Scale (Fujita Scale) is the categorized terminology used for measuring Tornadoes. The range goes from F0 to F5. If you hear about F5 Tornadoes you can rest assure that there will be plenty of destruction. Question 6: How long does a Tornado last? Answer 6: This can vary, a Tornado typically lasts no longer than 10 minutes but that’s not to say they don’t continue much longer. In fact a Tornado can last up to hour or more but thankfully this is rare. Question 7: What is the wind speed of a Tornado? Answer 7: Tornadoes can have wind speeds from 110 mph to 300 mph. An F5 Tornado has the more powerful devastating winds. Question 8: When are Tornadoes most likely to occur? Answer 8: Although a Tornado can occur anytime of the year the northern states are more at risk during the summer months while southern states are more at risk from March to May. As mentioned above these are only peak times, a Tornado can strike anytime of the year. Enjoyed the Easy Science for Kids Website all about Tornadoes info? Take the FREE & fun all about Tornadoes quiz and download FREE Tornadoes worksheet for kids. For lengthy info click here. Declan, Tobin. " Tornado Facts For Kids ." Easy Science for Kids, Apr 2019. Web. 18 Apr 2019. < https://easyscienceforkids.com/all-about-tornadoes/ >.